We had one of the strangest winters this year in Phoenix, AZ. It was unusually wet and cold. We didn't get monster rain storms as in past years but we had a lot of rain on a regular basis. We're not complaining by any means - just letting you know this year has been very different. 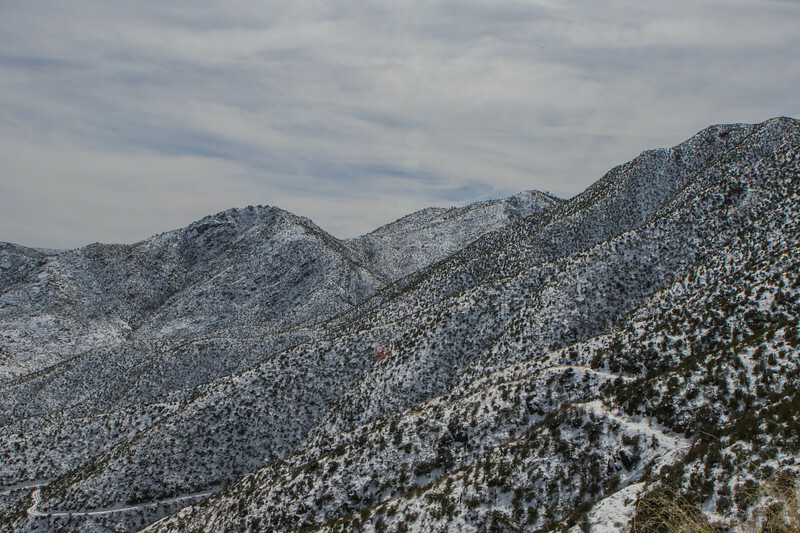 There had been a couple of slight snow dustings as well on the outskirts of town this winter, but a few weeks ago there were record snowfalls in the mountains that came down to the outskirts of Phoenix. Flagstaff, AZ which is about 2 hours away from Phoenix had a record 38 inches of snow from one storm in a 48 hour period of time. 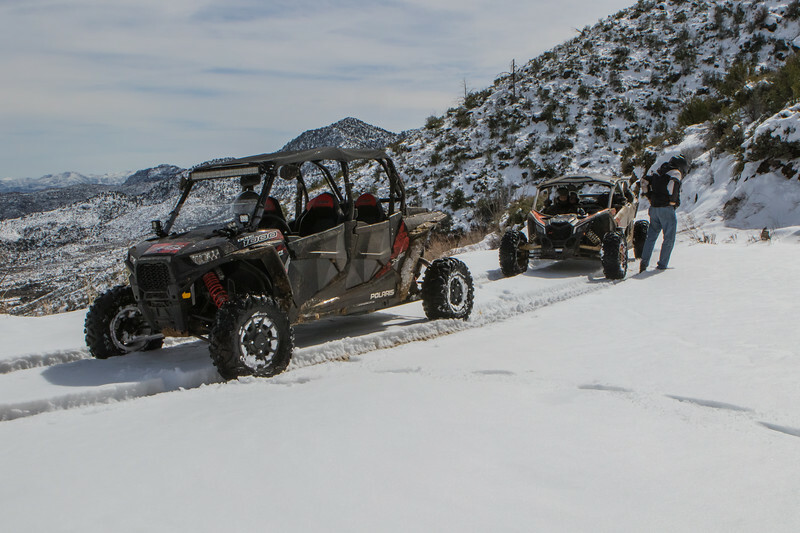 Since the snowfall was so close to town it was time to load up my new to me, 2018 Polaris RZR XP4 1000 and see how the stock Maxxis Bighorn tires do in the snow. I called a friend of mine, Troy, who showed up with a 2018 Can-AM XR Turbo. 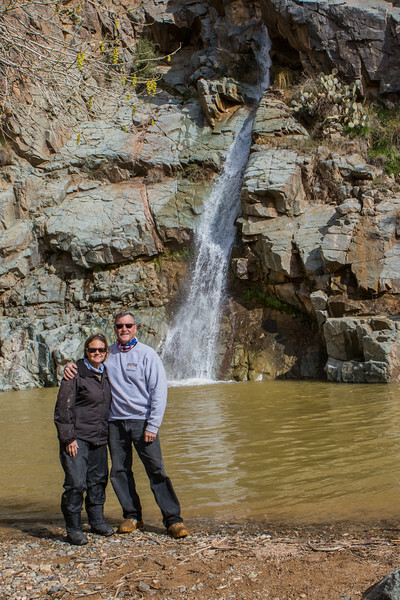 After unloading we had to go take a look at the first water crossing that leads to a 70-foot waterfall. 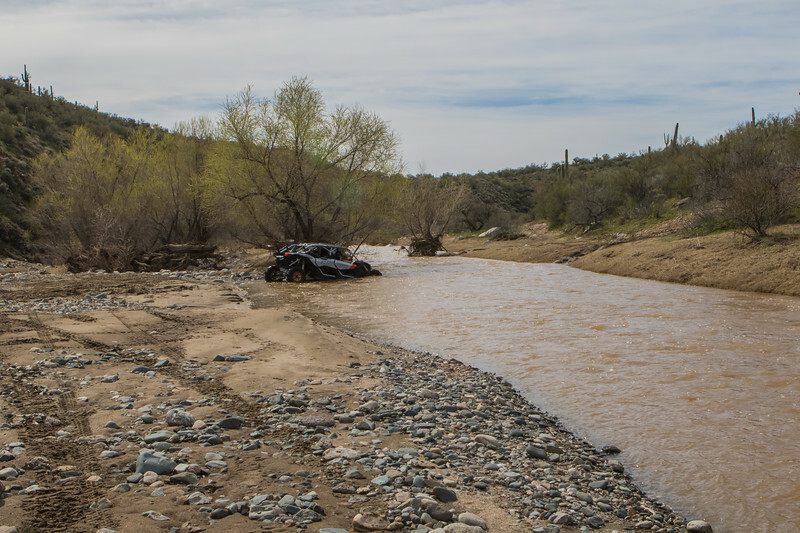 There are 16 water crossings in total to get to the falls and usually, when the water is flowing like this you can't make it across the creek as it is too deep and flowing too fast to cross safely. Troy could have probably bombed across but there are some crossings much wider and deeper so we opted to go play in the snow. Within a couple of miles of unloading, I hit one of my favorite trails that goes to the top of one of the smaller mountains and snakes along it like riding on a dragons back. Before we reached the top there was snow. For us flatlanders this was exciting! I've been on this trail numerous times, it's steep rocky and rutted. 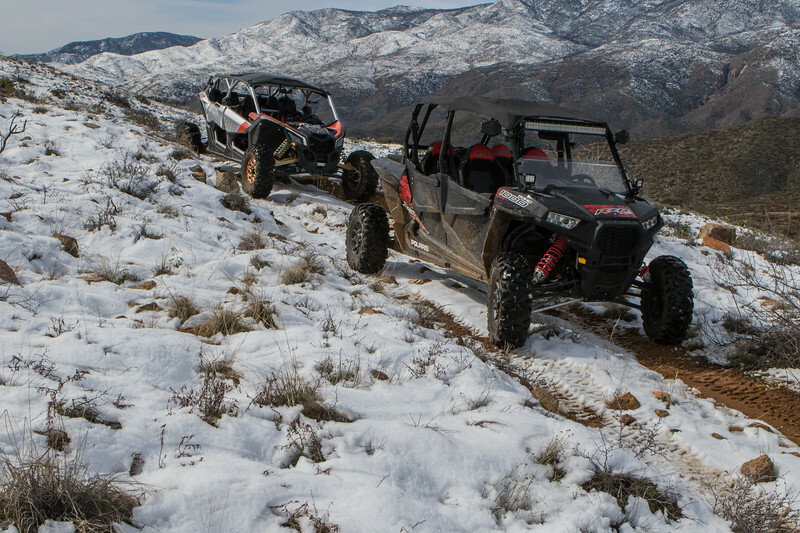 One could say it's a normal desert trail except for a little snow added to the mix. 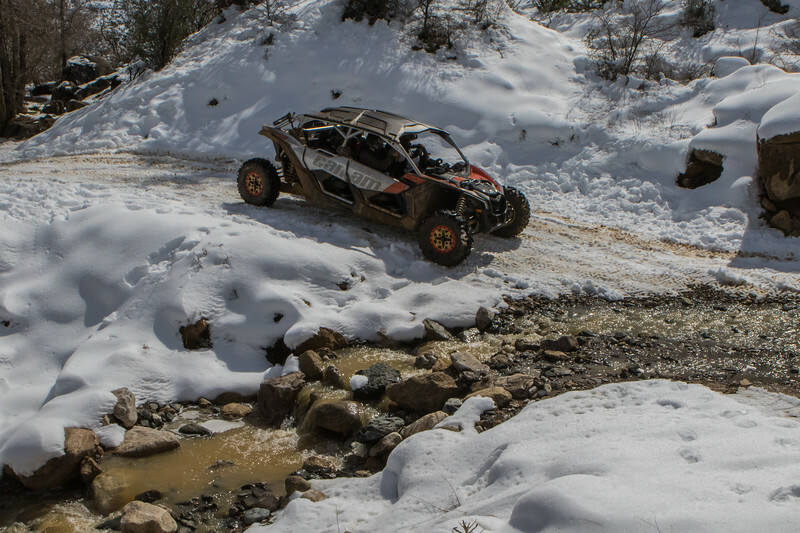 So far the Maxxis Bighorn tires were doing great in this rough terrain. 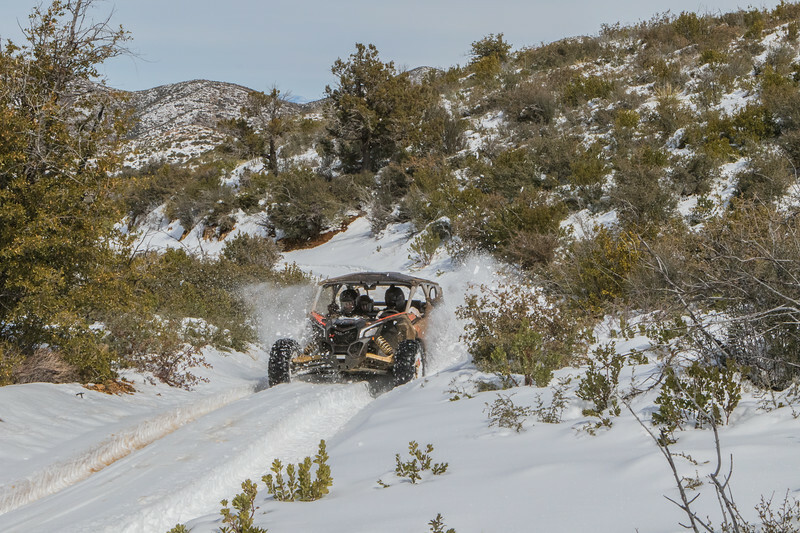 Our intentions were to head up the main road toward the old gold mining town of Crown King and turn off on a trail up and over the taller mountains to a Jeep trail called Desoto Mine. After our turn off at the base of the first switchback, the snow was much deeper. There was a neat smaller waterfall with deep snow on the side of it that we just had to stop to take a photo of before continuning our way up the mountain. The trail was getting interesting now as there was only one track from someone before. 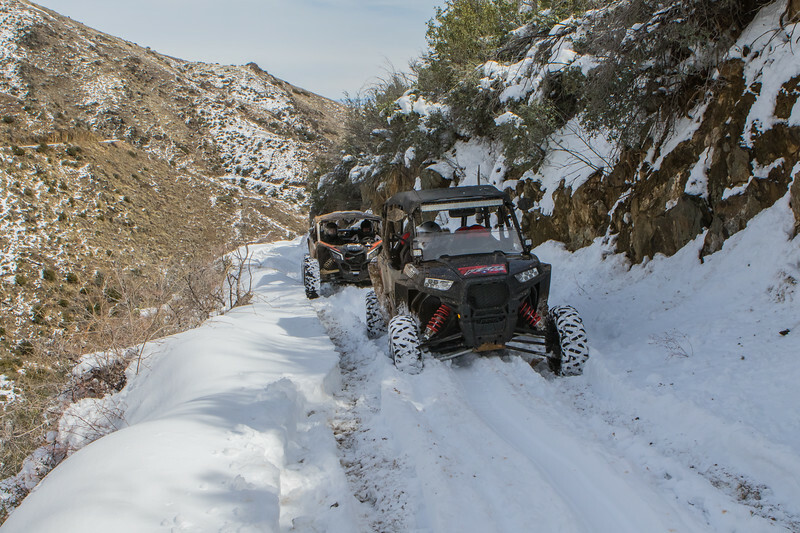 I guess I should have had Troy lead with his 32-inch Bighorn tires, although his Can-Am is 72-inches wide and mine is only 66-inches wide so I couldn't fit in his tracks anyway. See WHEELS on Your Vehicle!!! At one point I was struggling a bit and stopped to not tax the belt. When I got out the snow went up to my knees - pretty cool, again for us flat laners! We made it up to an overlook and stopped to take a peek before continuing up to the top. It was incredible to see all the snow on the vast desert mountains. As we were nearing the top of the mountain someone put a wire gate across the road with a no trespassing sign. I know there is a house on the north side off this road but this is a BLM road. Oh well, we turned around. Maybe this was a good thing as the snow on the north side of the mountain is usually much heavier and it could have ended badly. As we were winding our way back Troy was having fun kicking up the snow as we headed back down the mountain. As we were headed back to the staging area I decided to take a short detour to show off the waterfall that I was certain would be flowing with all the snow and rain in the lower elevations. The nice thing about living in Phoenix is you can drive up into the snow and within a short distance be back in the desert. 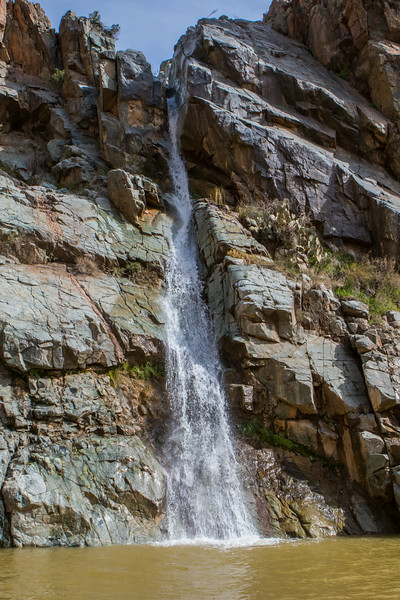 It's always amazing to see big waterfalls in the desert. This one had some awesome colorful rocks as well. To give you an idea as to the height which I estimate to be about 50 feet tall, here's a photo with my wife and me for perspective. 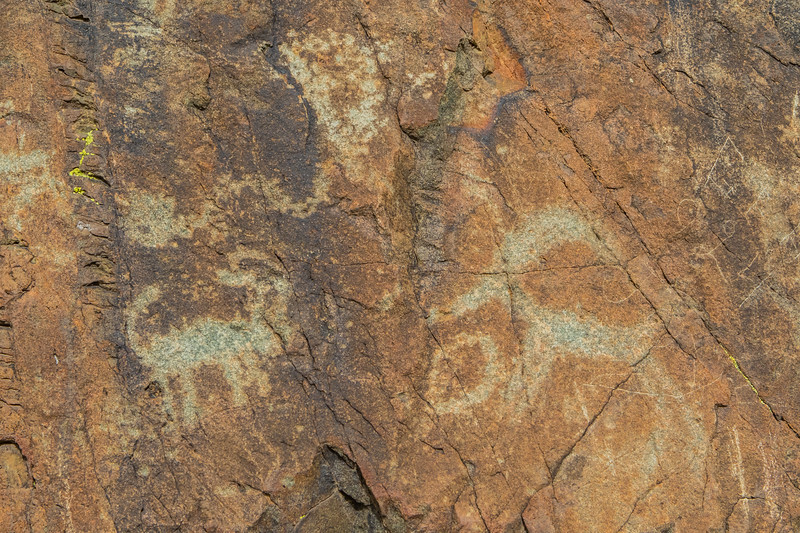 There are some ancient Indian Pictographs’ on some rocks near the falls too which is always cool to see! With this last stop, it's time to get back to the staging area so we can get home and clean the mud off the rigs. 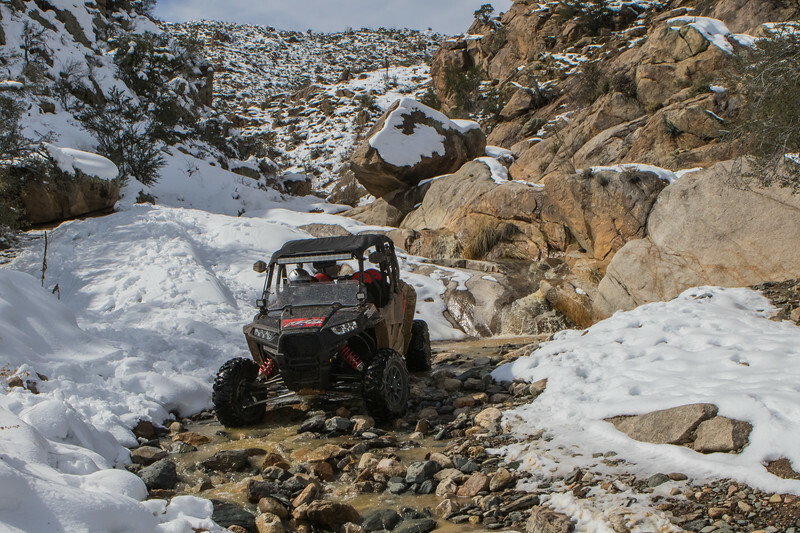 It was a fun first ride in our RZR and both side by sides with Maxxis Bighorn tires did great in the snow and rocky desert trails. Since this is a "new to me" side by side, just like many others I'm weighing my options for replacement tires and wheels to test. 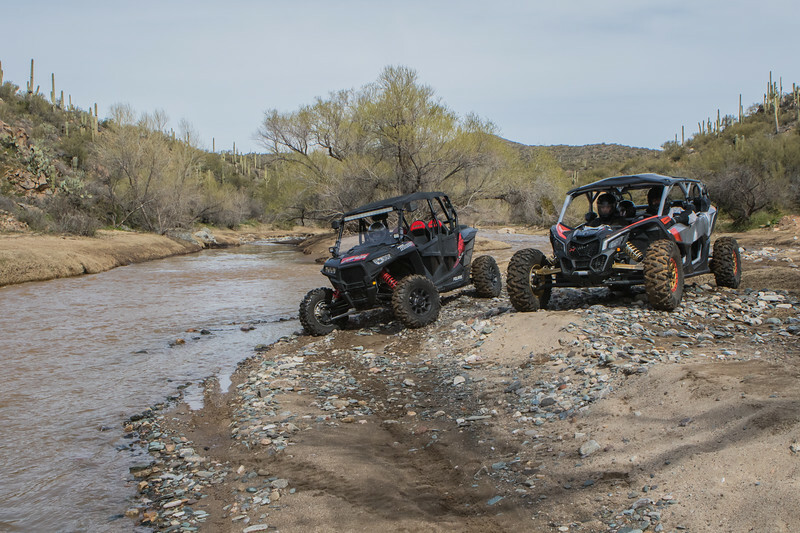 Stay tuned to see how the new tires and wheels hold up to the rugged, rocky trails in AZ and UT! Remember, be safe, pack out what you pack in and buy all of your tires and wheels for all of your vehicles from Discount Tire or Discount Tire Direct!! !